The Good Boy Barkington Duck Soft Dog Toy has been made out of soft plush materials and covered with a tough hessian to help withstand dogs who like to carry their toys around in their mouths. Made with 2 braided rope legs and an internal squeaker, Barkington Duck may be the perfect basket companion for a quick snooze, but he's also tough enough for a healthy game of fetch and carry, or a tiring game of tug. 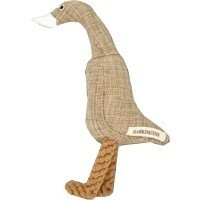 Please Note: Barkington Duck is not indestructible and not suitable for strong or avid chewers. All play should be interactive and supervised.